I wrote this post a while ago and wanted to wait until after I got pictures off the camera onto the computer before publishing it. It is getting late and I am about to plant seeds for next summer, so I am going to add pictures later. For a list of vegetable days to maturity please click here. In 2016 I planted most tomato seeds on a heat mat, I have written the planting date for all of the varieties as well as the date they flowered and when the fruit first ripened. They all germinated well, but they did not grow past cotyledon stage for an exceptionally long time. My garden was over run with Rutherglen bugs for quite a lot of spring, they swarmed over the growing tips of all my plants causing a lot of bud drop and other issues. Once the Rutherglen bugs started to disappear the green vegetable bugs picked up in number. All of this means that my tomato season is very late this year. I planted out tiny seedlings at their second leaf stage at 05/11/2016. Angora 82 seeds planted 20/08/2016, germinated 30/08/2016, flowered 15/12/2016, first fruit ripe 25/12/2016 Reasonably small plant which may or may not be dwarf, very productive with about 20 flowers per truss. Small, red, round tomatoes which taste really nice. This plant gave a large yield very early, has regular leaf and appeared to be determinate but kept putting out occasional new branches with flowers until the frosts. Micro Tom seeds planted 02/10/2016, germinated 11/10/2016, flowered 22/11/2016, first fruit ripe 07/01/2017. 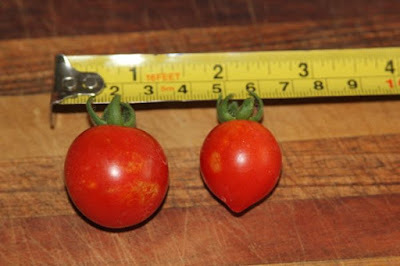 Micro Tom is the smallest variety of tomato ever bred and I have never had one over 10cm tall. 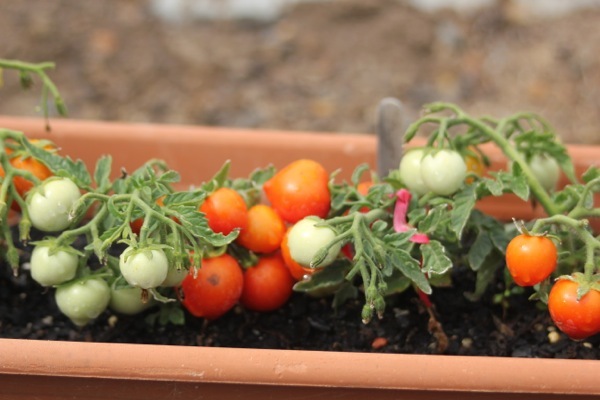 This plant yields about 10 tomatoes per plant. The taste is far from amazing, but I have eaten many varieties that were worse. Micro Tom has regular leaf, is a micro dwarf, and is determinate. St Pierre was given to me by my neighbour and was already flowering. It was transplanted into the vegetable garden as a large flowering plant 29/10/2016 and the first fruit was ripe 08/01/2016. It grew reasonable sized, red round tomatoes that had a great tomato taste. The fruit takes a long time to ripen which I am not overly happy with, but the rich tomato taste and high yield makes up for this. It had a lot of blossom end rot this year and the leaves drooped on hot days. St Pierre tomato gave a very large yield over a long season, it is regular leaf and indeterminate. Little Oak Like seeds planted 20/08/2016, germinated 31/08/2016, flowered 20/12/2016, first ripe fruit 17/01/2017. I have no idea why this is called 'Little Oak Like'. Sturdy little plants that grow about 1 foot tall. Being an old Russian heirloom it is hardy and absolutely delicious. This has a deep rich, old fashioned tomato taste, one of my favourite tasting red tomatoes. 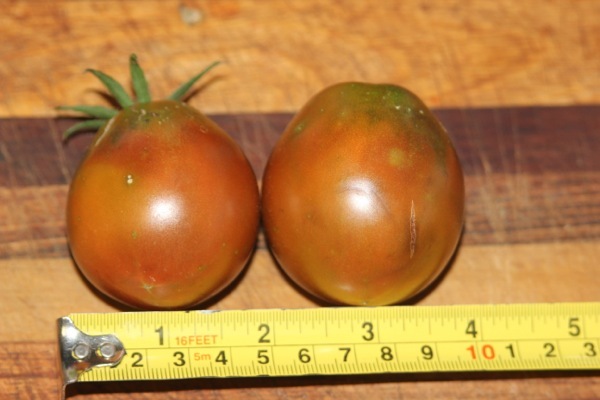 This plant has a very large yield over a reasonably long season for a determinate tomato. It had a lot of blossom end rot early this year. Little oak like tomato has regular leaf and is semi-determinate or determinate. 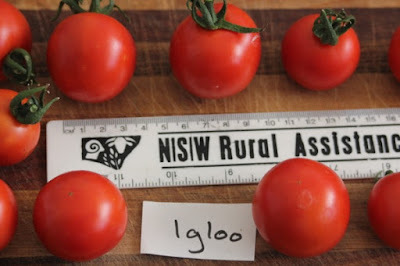 Igloo seeds planted 20/08/2016, germinated 27/08/2016, flowered 09/12/2016, first ripe fruit 18/01/2017. These are sturdy stocky short plants that are the most productive determinate tomato I have ever grown! This was the first tomato that I ever bred and I am rather fond of it and glad to have it back again. 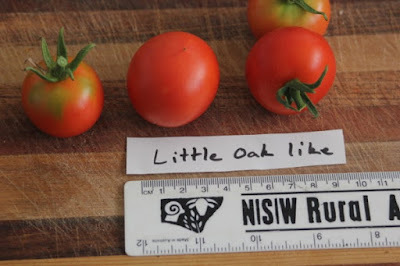 This looks a lot like 'Little Oak Like' but if far far more productive and not quite as tasty. 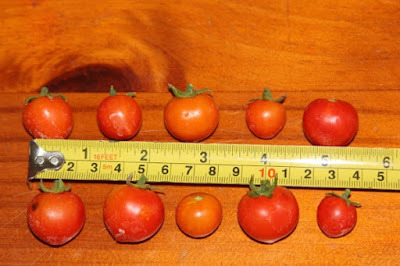 Extremely large yields of round red tomatoes over a surprisingly long season for a determinate plant. It had a lot of blossom end rot early this year which disappeared later in the season. Update - if the fruit is left to almost over ripen it tastes just as good as Little Oak Like. Igloo tomato has regular leaf and is semi-determinate or determinate. Tommy Toe seeds planted 24/09/2016, germinated 09/10/2016, first ripe fruit 20/01/2017. These are tall plants with many flowers and small red round fruit. These taste pretty good, not anywhere near as good as Little Oak Like, but still very nice. They produce rather tall and rampant plants which produced very large yields over a long season. 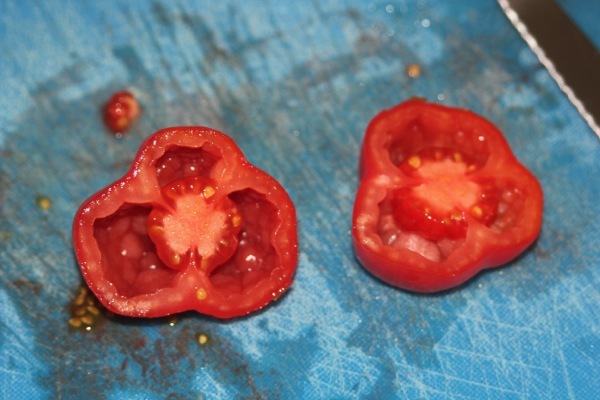 Tommy Toe tomato has regular leaf and is indeterminate. Nanuq seeds planted 20/08/2016, germinated 26/08/2016, flowered 06/12/2016, first ripe fruit 21/02/2017. This was another very short plant. I bred this variety when I was at high school and it is actually pretty good. 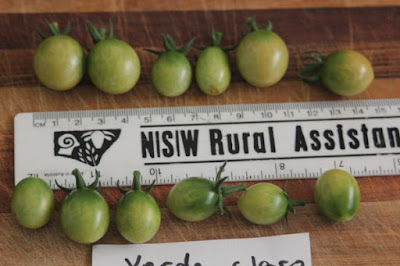 Very tasty and sweet tomatoes, perhaps not the most productive but not too bad for a plant of this size. Whispy foliage, rather weak looking plants provided a small to medium yield over an extremely short season which is common for determinate plants. 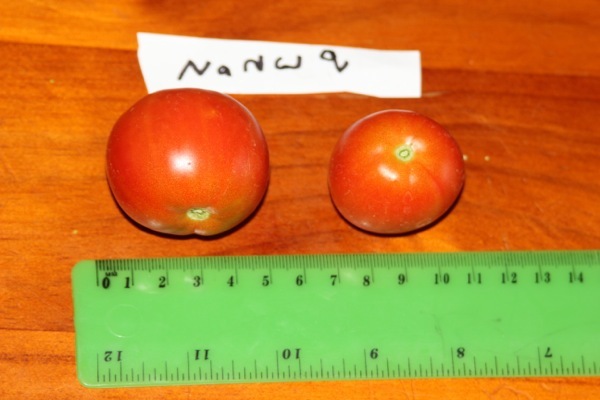 Nanuq tomato has regular leaf and is very determinate. Yellow Pear seeds planted 20/08/2016, germinated 03/09/2016, flowered 10/01/20, first ripe fruit 23/01/2017. I have saved seeds from this one since my first son was born. It is a large rampant plant that after years of deliberate selection now holds up to extreme conditions and always returns a massive yield over a long season. It takes several heavy frosts to kill this one. 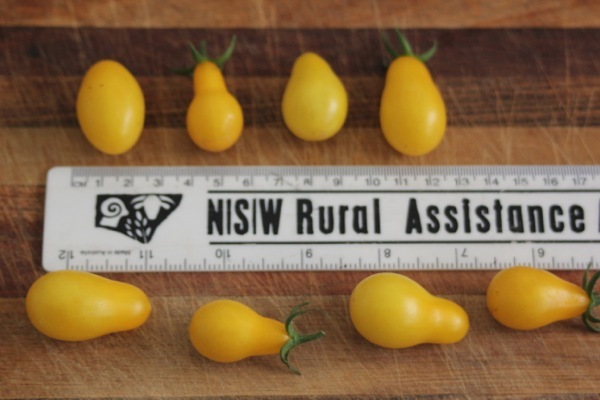 It grows pretty, pear shaped, yellow cherry tomatoes that kids simply adore. Yellow Pear tomato has regular leaf and is indeterminate. Paprika Shaped seeds planted 20/08/2016, germinated 28/08/2016, flowered 20/12/2016, first ripe fruit 26/01/2017. This is a small, dwarf, yet highly productive tomato plant. The tomatoes look like little red capsicums and are hollow. Some fruit grew no seeds at all. The plants were pretty productive over a relatively short time. The taste was not amazing raw, but they are intended to hollow out and cook. Paprika Shaped tomato has regular leaf and is semi determinate. Verde Claro seeds planted 20/08/2016, germinated 26/08/2016, flowered 11/12/2016, first ripe fruit 27/01/2017. This is a nice looking, clear epidermis, green when ripe cherry tomato. It grows into a reasonable sized plant that has large yields over a long season. This is one of the best tasting tomato varieties I have ever eaten. Green when ripe tomatoes generally taste pretty great, but this is far superior to anything I have eaten before. They are amazing, utterly amazing. Like no other tomato I have ever tasted. 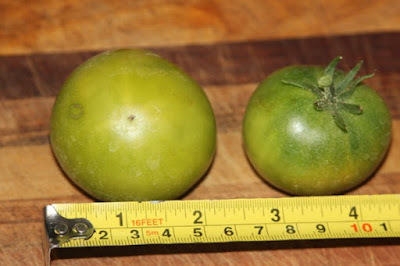 Verde Claro tomato has regular leaf and is indeterminate. Helsing Junction Blues seeds planted 20/08/2016, germinated 28/08/2016, flowered 20/12/2016, first fruit ripe 03/02/2017. 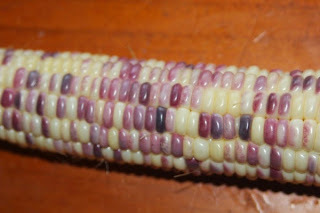 These taste ok, the unripe fruit looks amazing with its high anthocyanin purple. 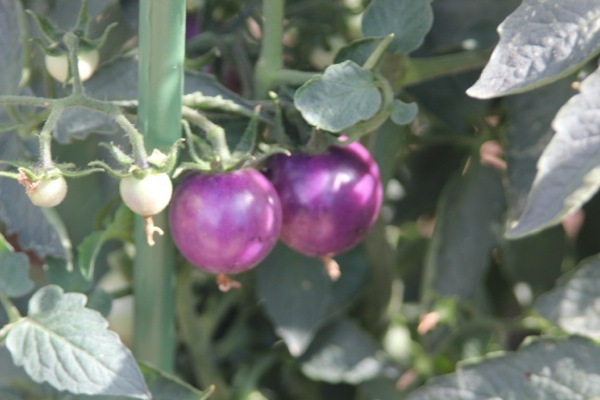 As the fruit ripens it is not as dark as 'OSU Blue' which was one of the varieties used to create it. It tastes ok when it is not quite ripe and far better when it is perfectly ripe. It had a medium yield over a long season. Helsing Junction Blue tomato has regular leaf and is indeterminate. Unnamed Dwarf Multiflora seeds planted 20/08/2016, planted 01/10/2016, germinated 08/10/2016, flowered 11/12/2016, first fruit ripe 03/02/2017. 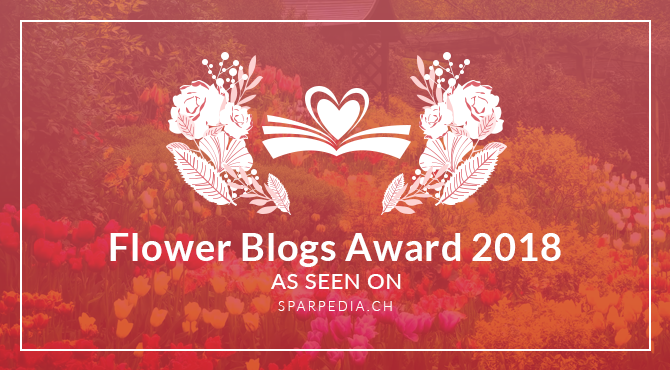 I wasn't going to grow these this year, but made space so included them in my growing list. I counted 124 flowers on one single truss and 148 flowers on another truss, some trusses appeared to have even more flowers. Not all of the flowers set, I am trying to work out how to increase the number of fruit set as far too many drop for my liking. It had a medium to large yield over the season. 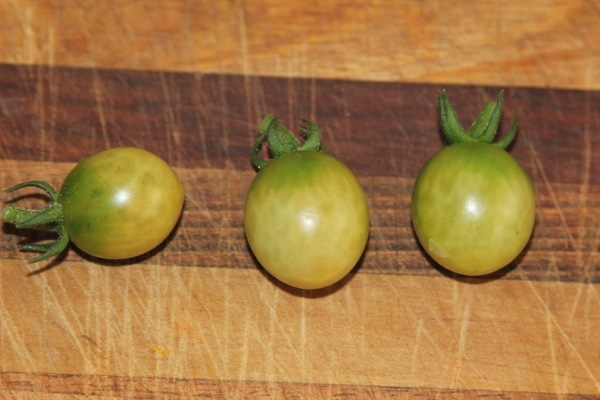 Dwarf Multiflora tomato has regular leaf, carries the multiflora gene, is dwarf, and is indeterminate. Julia Child seeds planted 20/08/2016, germinated 30/08/2016, flowered 20/12/2016, first fruit ripe 03/02/2017. These are lovely tasting, large pink tomatoes which are very soft. This is a great tasting tomato. This year they had a lot of blossom end rot, I have never seen that in this variety before. They are pink/red and are generally pretty large fruit. Julia Child tomato has potato leaf and is indeterminate. Summertime Gold seeds planted 11/09/2016, germinated 25/09/2016, flowered 16/12/2016, first ripe fruit 10/02/2017. 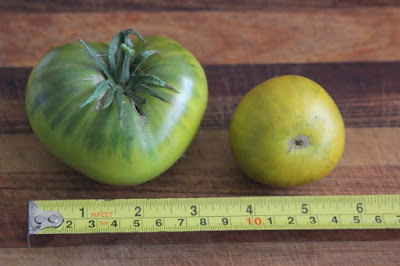 This one was bred by the Dwarf Tomato Breeding Project but was strangely tall for a dwarf. It has some of the largest potato leaves that I have seen and is a stunningly ornamental plant. A lot of flowers aborted for some reason which is why the time from flowering to ripe fruit is so long. The yellow tomatoes taste pretty good, much nicer than I was expecting. Unfortunately it was dreadfully unproductive and besotted with every pest in the area, I may grow it next year to see if it was just a bad year. 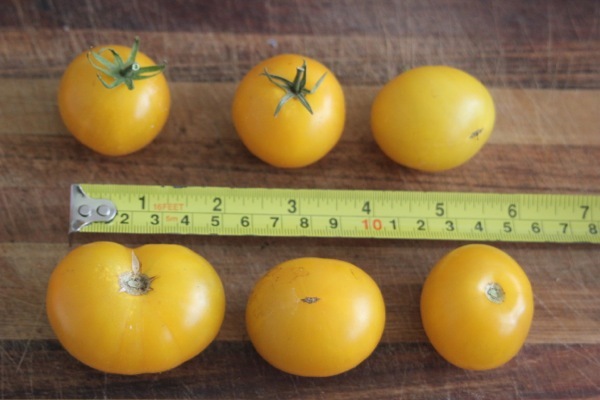 Summertime Gold tomato has potato leaf, is dwarf and is indeterminate. Dwarf Jade Beauty seeds planted 11/09/2016, germinated 25/09/2016, flowered 16/12/2016, first ripe fruit 12/02/2017. 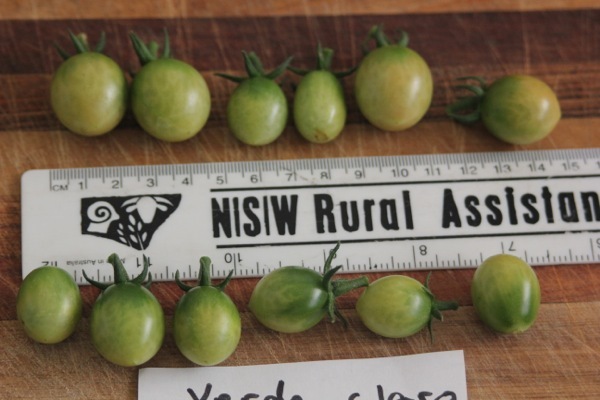 This is another one from the Dwarf Tomato Breeding Project. This dropped fewer flowers than Summertime Gold so was far more productive for me this year. It was also a lot shorter plant than Summertime Gold but did eventually get reasonably tall for a dwarf. Green when ripe tomatoes are generally pretty tasty and this is no exception. It produced very sweet green when ripe fruits. Dwarf Jade Beauty tomato has large potato leaf, is dwarf and is indeterminate. Sarah's Galapagos seeds planted 20/08/2016, germinated 29/08/2016, flowered 07/01/2017, first ripe fruit 14/02/2017. Originally found growing wild on one of the the Galapagos Islands and the fruit is eaten by the tortoises there. This is likely a stable natural hybrid of several wild tomato species. This grew delicious and tiny cherry tomatoes. The yield was late but once it started it produced masses of tiny fruits. Sarah's Galapagos tomato has regular leaf and is indeterminate. Malakhitovaya Shkatulka seeds planted 20/08/2016, germinated 31/08/2016, flowered 20/12/2016, first ripe fruit 15/02/2017. This is an amazing tasting green when ripe tomato. 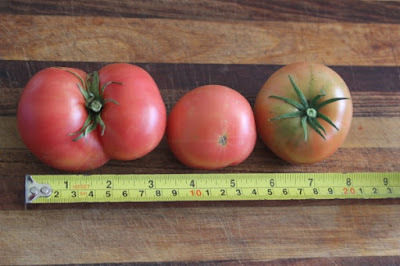 This is a great tomato, nice size, amazing taste, I just wish it was more productive. Malakhitovaya Shkatulka tomato has regular leaf and is indeterminate. Japanese Black Trifele (spelled various ways), originally called "Yaponskiy Trufel Chernyi" or in Russian "Японский трюфель черный" seeds planted 20/08/2016, germinated 29/08/2016, flowered 11/12/2016, first ripe fruit 21/02/2017. This old heirloom Russian tomato is meant to be one of the best tasting tomato varieties. It is not even close to the horribly bland things you can buy from the markets. 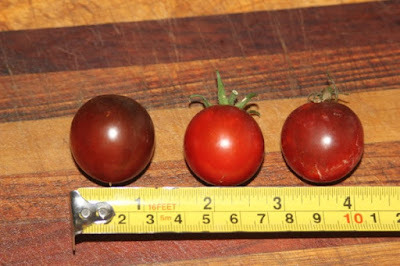 Deep, rich, sweet, tomato taste that is difficult to describe but easy to remember. It produced late this year but was absolutely covered in dark ripening pear shaped fruits that continued until frosts. 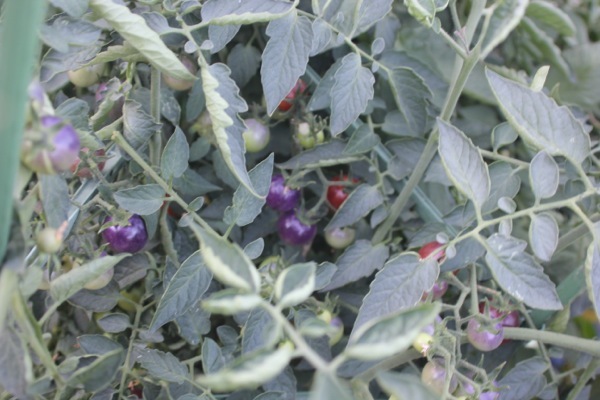 Japanese Black Trifele tomato has potato leaf and is indeterminate. Snow White seeds planted 20/08/2016, germinated 01/09/2016, flowered 10/01/2017, first ripe fruit 21/02/2017. Normally this is my first tomato to ripen, something is amiss this year! These are delicious and fruity tasting cherry tomatoes that my children adore. Usually it is incredibly productive, this year not so much as it didn't have long before the frosts came. Snow White tomato has regular leaf and is indeterminate. Totem seeds planted 10/09/2016, germinated 25/09/2016, flowered 11/12/2016, first ripe fruit 22/02/2017. Why did I even grow this, Yuck, what a dreadful tomato. It took a long time to ripen, it had a very low yield, and it tasted dreadful. The only nice feature is that the plants only got to about 1 foot tall, but so did several others that tasted far better and gave much larger crops. I haven't saved seeds as I do not intend to ever grow it again. It possibly even tastes worse and has a lower yield than Black Russian, and that tomato is horrible. Totem tomato has regular leaf and is determinate. Unnamed Yellow seeds planted 20/08/2016, germinated 28/08/2016, first ripe fruit 04/03/2017. 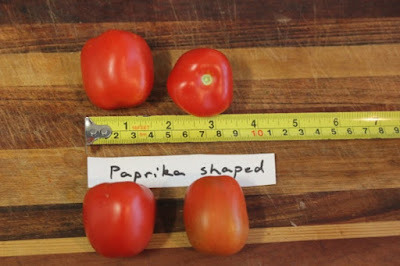 This is a great tomato, very pretty, nice size, great taste. Normally they are a lot faster to ripen, this plant was absolutely covered in ripening fruit when the frosts came. Unnamed yellow has regular leaf and is indeterminate. I grew a few other tomatoes this year too, but have decided not to include them in the list as many are not overly stable varieties yet. 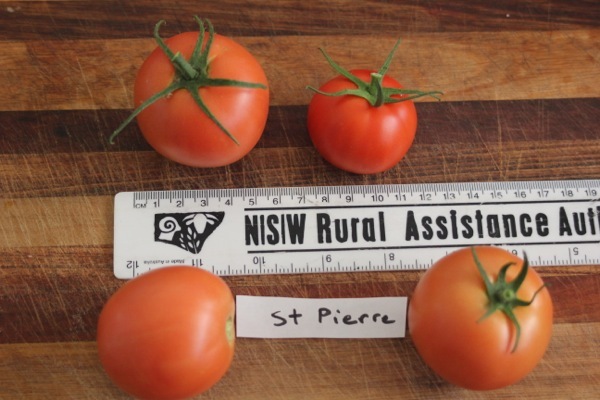 I sell seed of some of these varieties of tomatoes, along with other rare organic heirloom vegetable seeds, gourmet herbs and perennial vegetables on my for sale page.